Printable Black & White PDF Printable Color PDF More Paper Dolls & ClothesSo, I first got into viking clothing back when I did a ton of research and created my Viking paper doll and wrote a little article about 10th century Viking dress. It was fun, don’t get me wrong, but a lot of work. 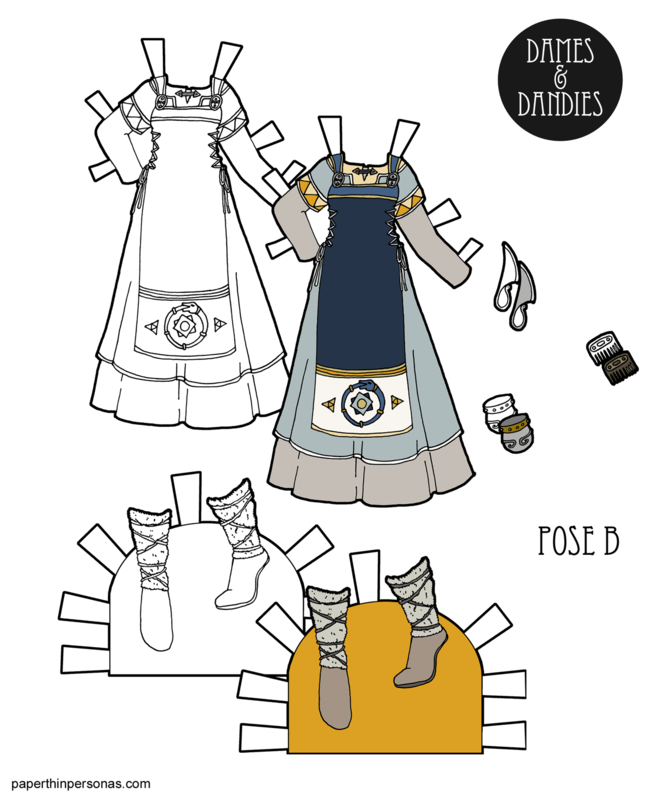 The truth is that while I enjoy drawing historical paper doll clothing, there’s always some pressure there. I want things to be accurate (to the best of my ability) and well cited. So, sometimes I just want to draw something that is inspired by a period of time without feeling like I need to do track down a source to justify my decision. This was one of those times. I just wanted to drawn an apron-dress. I didn’t want to mess around with trying to decide of dwarf brooches were worn by unmarried women and how long the dress was based on fragments of braid found in graves. I mean, that’s all fascinating stuff, but… sometimes I just want to draw a worm ouroboros and be done with it. That’s the symbol on her apron. It’s a serpent biting its own tail and it shows up all over the world. In Norse mythology (for those of you who weren’t obsessed with the ouroboros in high school), the serpent Jörmungandr encircles the earth, biting its own tail forming an ouroboros. Ragnarok (the end of the world) will begin when Jörmungandr lets go of its tail. Thor, the God of Thunder, will fight Jörmungandr, slay it and then die from the poison of the serpent. Anyway, along with her apron-dress, she has a pair of fur wrapped boots, a knife, cup and comb. This dress went through several different color schemes. This color scheme was my second one. My first attempt was yellow, reds and greens and I just didn’t like it as much as this blue and yellow version. I did toss up on my Patreon page. Head over there to download and print it, if you want a second color scheme for today’s dress or to build more of a fantasy viking wardrobe. While you’re there, think about joining to help keep the blog on the internets. It really does help offset my costs.